The Sechrist Model 4100 hyperbaric oxygen chamber is the largest and most advanced hyperbaric monoplace chamber in the world. The flagship chamber of our new H Model chamber product line, the 4100 hyperbaric chamber has a huge 41″ interior with extended room to allow a patient to rest reclined, thus making a patent more comfortable and anxiety free. The Model 4100 hyperbaric chamber has a fully integrated entertainment system which allows a patient to watch television and movies. The expanded size allows for comfortable treatment of patients up to 700 lbs. 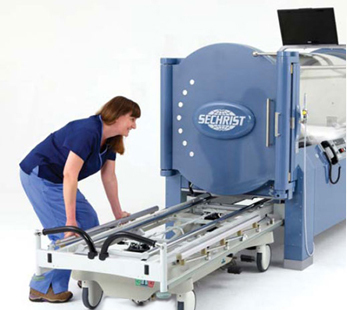 The specialized hyperbaric chamber gurney allows direct transport of the patient and slides easily into the chamber without additional transfers. 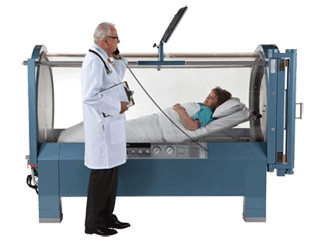 The H-Series Hyperbaric Oxygen Chambers are the advanced and convienent chambers on the market. With the new space-saving gurney storage the hospitals and clinics now have the ability to store the gurney under the hyperbaric chamber. This convenient storage allows for additional free space in any hyperbaric treatment room thus eliminating the additional space needed to store the free standing chamber gurneys. The low profile gurney lowers to 23″ from the floor to the top of mattress. This new low profile gurney design cuts a full 5″ off the high of a standard gurney. The new low profile hyperbaric gurney allows for an easier and safer access of the patient to the gurney. The H-Series Hyperbaric Oxygen Chambers are available in three spacious interior diameters – 33″, 36″, and the 41″. All Sechrist Hyperbaric Chambers provide the ability for the patient to rest in a reclined or angled postiion for better comfort. The H-Series Hyperbaric Chamber system allows connection with a fully integrated entertainment system that allows the patient to watch television, watch movies, or just listen to music on thier MP3 player. All Sechrist Monoplace Hyperbaric Chambers are equiped with dual spreakers to provide optimal listening pleasure. The low profile hydraulic gurney provides for easy loading of the patient into the chamber without additional transfers. 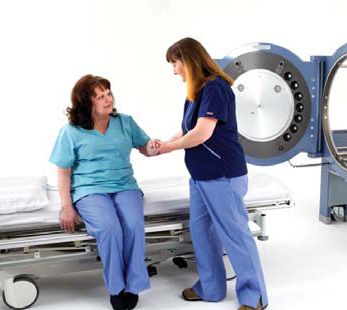 Within a Sechrist hyperbaric chamber bariatric patients up to 700 lbs can be comfortably treated. Sechrist Hyperbaric Oxygen Chambers are designed and tested to provide the most complete safety specific monoplace hyperbaric chamber on the market. All Sechrist hyperbaric chambers go through a thorough inspection and safety process that is monitored and maintained throughout the manufacturing process. Sechrist hyperbaric oxygen chambers are the only monoplace hyperbaric chambers that are fully manufactured and tested in the USA in our state-of-the-art facility. The H-Series Hyperbaric Oxygen Chambers is the only monoplace hyperbaric system that provides two emergency vent modes. The Standard Emergency Vent system decompresses in less than 120 seconds, and can be controlled by a technician to allow control of the descent and to optimize for patient comfort. The H-Series Hyperbaric System also includes an Emergency Shut-off and Automatic Vent System for full decompression within 120 seconds without the need of an attendant. The Sechrist H-Series hyperbaric oxygen chambers are all equiped with the necessary monitors and controls to accept electronic data collection modules. With precision controls and easy viewing displays the Sechist H-Series Hyperbaric Chambers are easy to use and adjust by the attending pysician or technician. All Sechrist oxygen chambers have easily accessible ventilation controls for the adjustment of gas flow through the chamber for complete oxygen conservation. Sechrist’ s Oxygen Conservation Mode significantly reduces the amount of oxygen consumed during a treatment. Electrical monitoring including EKG, temperature and blood pressure.